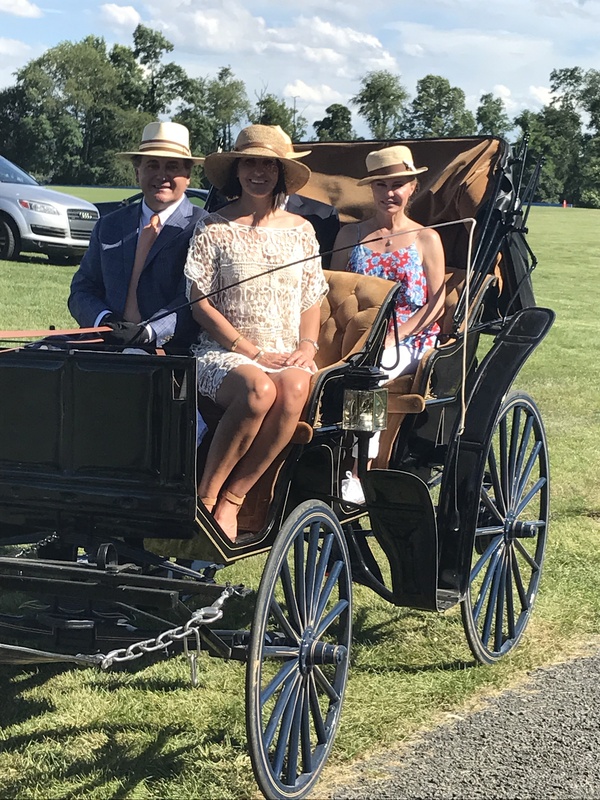 By the kind invitation of Nelson Gunnell, the Piedmont Driving Club was invited to display carriages during a polo match at his Banbury Cross estate in Middleburg, Virginia. The weather on Sunday, June 25, was perfect for polo, driving and for those who sat and watched both. Seven turnouts arrived for a drive from Banbury and down a shaded road to Rutledge, home of former PDC member Monica Greenburg and now co owned and managed by her son, Aleco Bravo-Greenburg. We were privileged to drive over winding lanes of pea gravel, carefully constructed for ease of travel by horses and carriages. We passed the breathtaking stone mansion (circa 1740) and by the broodmare barn, shops, office and various other buildings. Eventually we came to a polo field where Caroline Cox had set up a refreshment stop with cups of berries soaked in Bauchant and rum punch made even more fragrant by a sprig of mint. 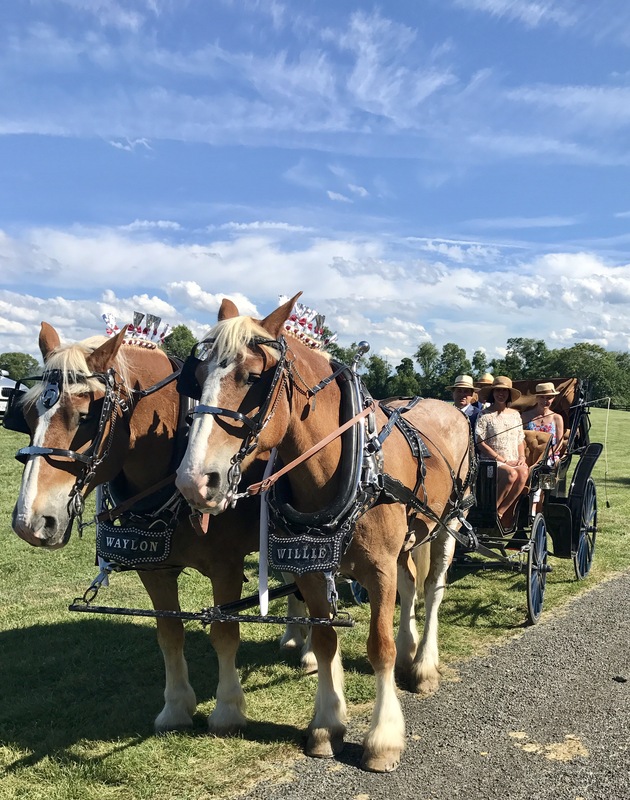 Before we were able to indulge, however, Carl Cox reminded everyone that we had agreed to a “carriage exhibition” and that the several hundred people who were assembled to watch polo would be expecting to see us. What better place to practice our “review” than this empty polo field! Carl directed whips in the proper way to enter, circle, line up straight (FRONT AXLE to FRONT AXLE, please!) and leave the formation in an orderly fashion. We worked through it a couple of times and then rewarded ourselves with the treats at the rest stop. Time to move off, we trotted from Rutledge, through Banbury, down a road and through some woods. In front of us was another polo field, this one rimmed with a cheering crowd and it was time now to display our carriages. In we trotted, just as we had practiced. We lined up, saluted, and Maryalice Matheson-Thomas alighted from the Cox carriage to explain each of our turnouts to the spectators, but NOT before Bobby Dryer had announced us with his coaching horn. Whips for this event were Carl Cox, Mary Munster, Mark Duffell, Dr. Tom Albert, Lisa Andersen, Wayne Porter and Barbara Wolf. Once unhitched and unharnessed, we were invited by Nelson to watch polo. He graciously offered seats in the shade, access to his open bar and, maybe best of all, LUNCH which consisted of oysters, crab cake sandwiches, lobster rolls, homemade chips and ice cream. What more could anyone want??? It was a spectacular day for the Piedmont Driving Club, a chance for us to show who we are and also an opportunity for those Club members who participated to realize how valued we are within this community.